LOVEThESIGN is the Italian e-commerce dedicated to home design. Established in 2012, it is currently undergoing significant international growth thanks to a young and vibrant team who, every day, select the best design products and latest furnishing trends. In 2015, it was named Best E-commerce Website by Netcomm. MailUp has proven to be an effective tool for the scalability of automatic email delivery mechanisms during a period of growth such that experienced by LOVEThESIGN. This has allowed us to achieve much more engagement and a percentage of inactive users below the market average. In LOVEThESIGN’s first year of business, it needed to integrate a platform to handle email mailings with business intelligence data relating to the customer base, which all the data of subscribers to the website and newsletter merges into. With the integration between MailUp and other corporate databases, LOVEThESIGN can handle targeted and personalized communications by setting up automatic campaigns, triggered by the interests and data collected from the user’s browsing. LOVEThESIGN gears its strategy towards streamlining the relationship with its e-commerce registered users. The first step in this direction is to ensure that those who land on the website from emails are automatically logged in, which can be done by linking the email address parameter in linked URLs (known as the token). The user can then start browsing smoothly, adding products to their cart and completing purchase in as few clicks as possible. What’s more, if the user is logged in, the CRM can track their preferences and trigger personalized re-engagement campaigns. From the time of registering, a stream of triggered emails will guide them towards making purchase in a smooth and effective way. The first triggered email (24 hours after registering) welcomes the user to the e-commerce with editorial-style engaging content, aimed at introducing the categories of goods and website communications. Special attention is paid to the display on mobile devices. 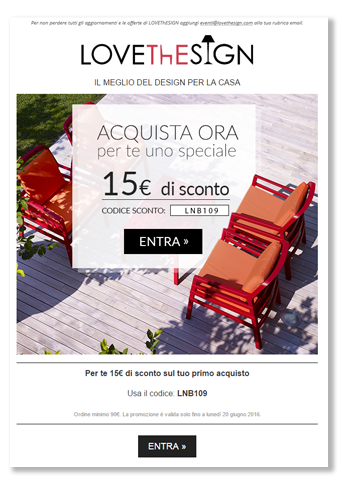 Three days after registering, an email is sent that encourages the user to invite their friends to the website, with the incentive of a coupon both for the inviter and invitee. If, within the first 7 days, the user does not complete a purchase, an email is triggered containing a small time-restricted discount and a selection of products from the best seller category. The goal: to transform subscribers into actual buyers as quickly as possible. Thanks to the implementation of the token, LOVEThESIGN is able to make browsing faster and optimize the user experience. Triggered emails strengthen your relationship with existing users who you already know, saving you time to invest in strategies to acquire new customers in other channels. Always send a friendly welcome email to familiarize yourself with new users, not to sell them something. Use the power of weak ties by inviting your e-commerce members to spread the word. You just need to give them a small thank you. Use automatic flows: the users’ browsing preferences will provide you with the automatic conditions on which to base your conversion campaigns.